After Targuman posted this picture on Twitter, which he aptly titled "Birds on a Wire," I immediately thought of the Leonard Cohen song "Bird on a Wire" and switched my iTunes to Willie Nelson's version. 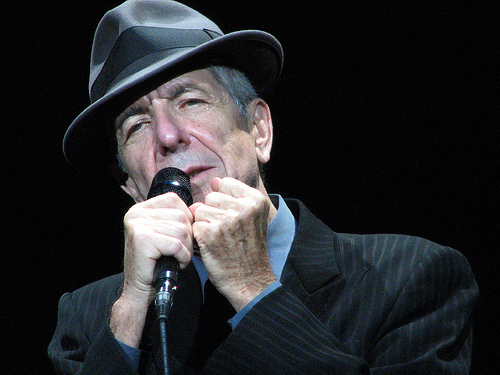 I am now listening to the entire album, titled Tower of Song: Songs of Leonard Cohen, again. It is heartfelt music with lyrics that contain depth, religious undertones, and an introspection rarely matched. I don't listen to entire albums much anymore with the advent of Pandora and shuffle listening, but this is an album that, when I listen to it, I always do so entirely. If you've never listened to the album, go do it now. Seriously. Leonard Cohen is a genius and this album is a collection of his songs as done by the likes of Willie Nelson, U2, Elton John, Bono, Tori Amos, and Suzanne Vega. Also, Leonard Cohen is releasing a new album soon that is expected to be just as brilliant as his previous work. Check it out.